For all intents and purposes, Ariel Sharon died on January 4, 2006. That was when he suffered a stroke and entered into a persistent vegetative state. However, his body was kept running by machines until just yesterday, so even though Sharon has been politically inactive since the mid-aughts, it is an appropriate time to discuss what legacy he left behind, with the benefit of most of a decade to see what followed. With the benefit of that perspective, Sharon represents a missed opportunity, a path not taken. For most of his life, Ariel Sharon was among the hardest of hard line Israelis, mostly indistinguishable from current prime minister Benjamin Netanyahu and the rest of the right-leaning Likud Party he was part of for most of his political career. Sharon only becomes a remarkable, interesting political figure at the very end of his political career, when he becomes Prime Minister in 2001, when he decided to pull a “Nixon goes to China”, withdrawing the Israeli military from the Gaza Strip and expelling nearly 10,000 Israeli settlers from that territory. This Sharon did because he decided that the two-state solution was in the Israeli national interest, and the two state solution requires a viable second state–in order for Palestine to work, it needs to control the West Bank and the Gaza Strip nearly in full. Large portions of Likud revolted against Sharon, and he was forced to create a new centrist party, Kadima. When he had the stroke in 2006, Sharon had plans to carry out a similar policy of withdrawal in the West Bank. Polls showed that he was expected to be returned to office with a narrow majority. Leadership of Kadima fell to Ehud Olmert. Olmert did not carry out a withdrrawal from the West Bank, but instead became bogged down in failed attempts to destroy Hezbollah and Hamas by bombing Lebanon and Gaza. These military mistakes destroyed Olmert politically, forcing his resignation. In the election that followed in 2009, Kadima was defeated by Likud, Benjamin Netanyahu became prime minister, and there has been no serious talk of evacuating the settlements in the West Bank since. What was the rationale for evacuating the settlements? Sharon rightly perceived that by settling the Palestinian territories, Israel was making it increasingly impossible for a viable Palestinian state to be created. This would mean that eventually the Palestinian territories would come to be part of a Greater Israel, and this poses a demographic problem for those wishing to maintain Israel’s status as a Jewish state. Bi-national Democracy–the Palestinians could be fully integrated into the Israeli state with the same legal rights Jewish Israelis retain. However, Israel would cease to be a Jewish state, and the Zionist ambition would be extinguished. Ethnic Cleansing–the Palestinians could be massacred and/or driven from the Palestinian territories by the Israeli military. This would irreparably damage Israel’s international reputation and would be regarded by many as a crime against humanity, but Israel has the military capacity to carry this out (albeit at significant resource cost) and has engaged in similar actions before, in 1948. Sharon viewed all of these options as unpalatable, and decided it was preferable to abandon Greater Israel instead. By giving up the Palestinian territories, Israel could avoid having to accept the Palestinians as citizens or take action to prevent them from receiving the rights of citizenship. The Cold War–the Arab states were on the Soviet team, Israel was on America’s team, so the United States had to do whatever was required to ensure Israeli victory over the Arab states, even if that entailed Israeli ethnic cleansing. The UN Resolution–the attempt by the Palestinians and the Arab states (viewed as comparable, if not superior to Israel in military power at the outset) to prevent the formation of Israel in 1948 was viewed by Americans and Europeans as an attempt to disregard the UN resolution that had called for the creation of Israel in the aftermath of the very recent Holocaust, which was fresh in their minds. The Cold War is over, eliminating the need for western states to retain Israel as a regional proxy or to view the Arabs as part of a global Soviet empire. At this point, the Israeli military not only far outclasses what resistance the Palestinians can muster, it dwarfs the power of the surrounding Arab states, many of which are currently in political crisis and pose no immediate threat to it. If Israel were to expel the Palestinians, it would be likely be viewed as unprovoked and morally indefensible. Israel’s western allies would likely cut off aid to it, and might even engage in sanctions. This loss of foreign support would be fatal to Israel’s strategic position in the long-run, as its population is too small and its reputation with its neighbors too poor for it to successfully maintain itself indefinitely without powerful allies. Sharon rightly perceived that the three-way choice of bi-nationalism, ethnic cleansing, or apartheid really just offered different roundabout ways to the same thing–the end of Israel as a Jewish state. The only means available to Israel to prolong itself as Jewish state would only serve to discredit it internationally and galvanize opposition to it both in the region and further afield. If Israel was to remain a Jewish state, the only viable choice was evacuation. Sharon’s successors have missed this, and as a result, since 2006, Israel has been on a default path that takes it in the direction of apartheid, which will eventually result in international condemnation, a Mandela-style equality movement that draws global support, and the eventual transformation of Israel into a bi-national state. The one state solution, not the two state, will prevail. This is not to say that the Palestinians did not make errors as well in recent years–the 2006 Hamas election sweep in Palestine and its subsequent takeover of the Gaza Strip ensured that Israeli politicians who opposed evacuation could credibly claim that evacuation resulted in the re-militarization of Israel’s enemies, and this made it harder for supporters of Sharon’s strategy to defend it to the Israeli public. Nonetheless, despite the Hamas victory, Israel’s current policy of settlement expansion can only end in a one-state solution that puts an end to the Jewish state. What fickle things human events are–if Ariel Sharon had so much as gone on a diet and managed to avoid a stroke for a few more years, the West Bank might have been evacuated and the two-state solution made a reality. Instead, we are embarking on a replay of the South African scenario that may take decades to work itself out, and which will ultimately cause much pain and suffering for both sides. I thought it was the corruption scandal that forced Ehud Olmert to resign, not security issues. There are more options than the 3 you mentioned. For example, a joint Israeli-Jordanian administration, or a far-reaching autonomy for the Arabs of Judea and Samaria (as indeed proposed by the Oslo agreements), or other creative solutions, some of which have been proposed before. And since you’ve mentioned ethnic cleansing, why not mention the cleansings of Jews – in 1920’s from the Golan and Transjordan, in 1948 from Jerusalem and from Gush Ezion and in the 1940’s and 50’s from almost all Arab states? Why were the Arabs (and the British in the 20’s) able to do that without any form of protest? NB – in 1948 the Soviet Union was on Israel’s side and supplied weapons via Czechoslovakia. The corruption scandal certainly contributed, though I question whether it would have been sufficient to push him out if the 06 Lebanon War had been a success. Those other options are at this point more theoretical than real possibilities. If the Palestinian territories are full of Israeli settlers, they will almost certainly continue be administered by Israel. I did not discuss other instances of ethnic cleansing because those other instances were not examples of the specific kind of cleansing I was talking about–expulsion of Palestinians so as to expand Israeli territory while maintaining a majority-Jewish population. There have certainly been many instances throughout history in which Jews have been ethnically cleansed, often by Arabs, but they are not relevant to this piece. The Palestinians and Arabs do not at present have the military capability to successfully ethnically cleanse Israelis. The USSR did indeed vote for the UN resolution that created Israel and supported Israel in 1948 for that reason, though I would argue that NATO countries were already intent on acquiring Israel as a Cold War proxy in 1948. The majority of Israeli’s consider the 2006 Lebanon war a success – Hezbollah has been dealt severe blows and lost a great deal of its capacity while the Israeli rear has been virtually unharmed and its moral undamaged. Also, Israeli’s consider corruption a much bigger threat than security issues, so I don’t agree with you on Olmert here. The options you’ve mentioned are equally realistic (or fantastic), and Gaza (and Sinai) were “full” of Israeli’s, and were cleansed of Jews nevertheless. If discussing the Arab exodus of Israel in 1948, the ethnic cleansing of Jews in the same period, in the same conflict, in the same region has to be mentioned at the very least. The claim the the Arabs have been “massacred and driven out by Israel in 1948” is debatable at the least. That the Jews were massacred and driven out by Arabs in 1948 and afterwards is undisputable. The separation of “Palestinians” and “Arabs” you make I don’t understand at all. As to the intentions of NATO countries – it was the intention of the Soviet Union to rule the world. But that’s not the point – what really happened is what matters. By the way, in the imaginary event Ariel Sharon would not have had a stroke, he would most probably have to resign over a corruption scandal of his own. And even if he didn’t, the odds that he’d be willing AND able to remove all Jews from Judea, Samaria and Jerusalem are about as big as the odds he’d rise from his grave and become Prime Minister again. If the two-state solution is ever made a reality, its only a first step towards a one-state solution – an Arab state (that will very quickly, like its neighbours, disintegrate into anarchy and civil war). Do they? I’d be interested in poll figures. If so, they have not paid much attention to the Winograd Commission’s report on the conflict. The options I mention follow from the premise that Israel will continue to settle the territories and will eventually come to possess them as a result. The Palestinians living there can either be full citizens (bi-lateral), partial citizens (apartheid) or evicted (ethnic cleansing). Israel cannot do anything else with those Palestinian citizens assuming they continue to settle the territory and come to possess it. I’m not seeing what role Arab ethnic cleansing of Jews in 1948 or in other times and places has in the analytical structure of this argument. If you’re making a moral claim that Israeli action in 1948 was justified, that’s a different argument that I am neither contesting nor affirming in this piece. 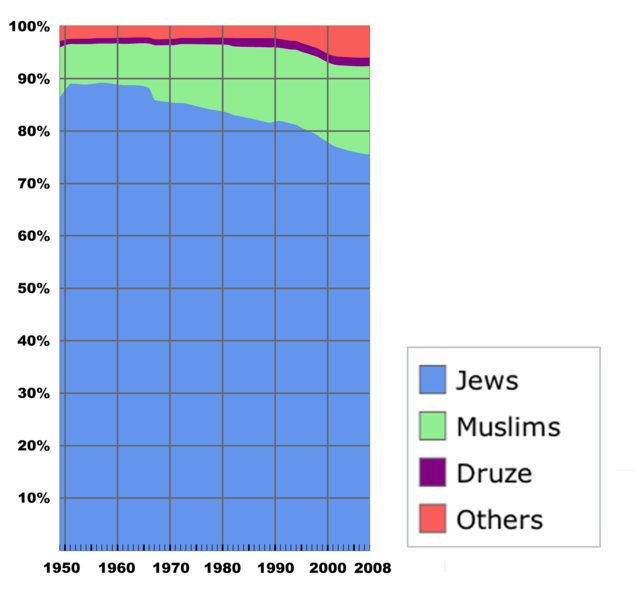 “Arabs” includes Egyptians/Syrians/Jordanians, the various Arab peoples that have, from time to time, attacked Israel or intervened on behalf of Palestine , “Palestinians” includes only those individuals living in Palestine, most of which are Arab (though a small number are Christian). The argument about NATO is an argument about why the countries in NATO supported Israel in 1948–their intent to win Israel as an ally against the Soviet Union in the Cold War offers a partial explanation for this support despite the ethnic cleansing that occurred. We’ll never know for certain what would have happened if Sharon had lived longer, but I submit to you that no other figure in Israeli politics had or has the standing to even so much as contemplate evacuation. If there was a figure who could have evacuated those settlements, Sharon was that figure. By what procedure do you envision the two-state solution becoming a one-state solution? The Arab residents of Judea and Samaria are citizens of Jordan. The evocation of citizenship done by the Jordanians is illegal and unacceptable. “partial citizens” does not equal apartheid, it can be as part of autonomous self-rule, or joint rule with Jordan, as I mentioned. The reference to ethnic cleansings of Jews by Arabs demonstrates that the Jewish concerns of a massacre by Arabs have a real historical basis, while Arab claims of Jewish-perpetrated “massacres” are, as I said, at the very least debatable. “individuals living in Palestine, most of which [you mean whom?] are Arab (though a small number are Christian).” – so now you don’t count Christians as Arabs? The British have supported the Jordanians (and Egyptians) in 1948 despite Jordanians cleansing Jews from Jerusalem no less. So NATO was not entirely on Israel side, was it? The procedure for the one-state solution is the same applied by Arabs to remove all Jews from the previously established Arab countries – massacres, forced removal of citizenship, harassments and deportations. The same procedure is being applied to Christians across the Middle East today. “no other figure in Israeli politics had or has the standing to even so much as contemplate evacuation. ” – really? And Begin evicting 5000 Jews from Sinai? I think Ben Gurion had some standing, too. I don’t think anyone in Israel has the “standing” to remove Jews from Old Jerusalem and the Western Wall again, thank God (yes, these are “settlements” too). The Palestinians cannot have truly autonomous self-rule without a viable state, which the settlements make impossible. Israel will not cede control of the occupied territories to Jordan or share control over them while those territories remain full of Israeli settlements. Whether or not ethnic cleansing is a possibility is not a matter of what has happened historically, it’s a matter of which group has the material military capacity to carry out cleansing. The Israelis have the ability to cleanse the Arabs, but the Arabs do not have the ability to cleanse the Israelis at this time. Excuse me, I meant “Arab Muslims”, but left off the “Muslims”. The British had to maintain friendly relations with the Egyptians in 1948 because of the need to maintain access to the Suez Canal, as this shipping lane was of paramount importance to the British Empire. When the Egyptians attempted to nationalize the canal in 1956, the Suez Crisis was triggered and Britain switched teams. Israeli military power and foreign support make a transition to one Arab state by the means you describe impossible at this time. The two-state solution does not imply a Palestine that is militarily a threat to Israel, indeed, Palestine’s economic output is much too low for it to be a credible military threat. Begin and Ben Gurion are both dead–there were no other figures at the time Sharon was prime minister and there are no other figures today. The generation of Israeli founding leaders of which Sharon was a part has no other living viable leaders to supply. The Basks have autonomous self-rule without a viable state, so do Native Americans, Chuvashians and many others. There are many ways to realize various degrees of independence, if there is only the will to do so. What Israel will or will not do, depends on the security arrangements it can get and the form of government that will be established. Whether or not there is a possibility of ethnic cleansing and to whom is, in fact, remarkably well proven by historic record. Jews have been purged from Arab states in 1948, from Gaza (twice – in 1929 and in 2005), from Jerusalem in 1948, from Sinai in 1981 and so on and on. Arabs of Palestine left in 1948 not by forced eviction, but for a multitude of reasons, mostly for fear of (imaginary) reprisals by the Jews for the (real) crimes commited by Arabs. They thought, and still think, the Jews would do to them what they’d do to the Jews if they had the capacity. They had a choice – to accept a Jewish state or leave. Some left, some remained. “The British had to maintain friendly relations with the Egyptians” – so Real Politics, not ideological battle with the Soviet Union dictated their policy? “the Egyptians attempted to nationalize the canal” – what? You mean “nationalized” – it was a successful attempt, not a failed one. “Palestine’s economic output is much too low for it to be a credible military threat.” – and Afghanistan’s output is how big? Still NATO invaded, didn’t it? Since when is military threat determined by economic measures? Its not like we’re in 1914, building battle ships. You said “no other figure in Israeli politics had or has the standing…”, I’ve showed there were figures who did exactly that. As to the fact that people die – well, they inevitably do that. And cemeteries are filled with irreplaceable people. I keep discovering pearls in your writing – “Sharon only becomes a remarkable, interesting political figure at the very end of his political career” – really? And in 1982, as Minister of Defence he was virtually unnoticeable, right? I see you still have a lot to learn if you “hope to become a professor and write books of interest and influence”. Getting the facts straight is one requirement. If Israel were to treat the Palestinians like Spain treats the Basques, the Palestinians would receive full rights of citizenship and a majority of Israeli voters would be non-Jews. That would be the end of Israel as a Jewish state, making it a bi-national democracy, regardless of to what extent the Palestinians also had regional autonomy. If Palestine stays part of Israel, you either give them the vote (making it bi-national) or you don’t (making it apartheid). There are no other options. The balance of power in the region today is completely dissimilar to the balance in 1948. In 1948 both Israelis and Palestinians had the military capacity to carry out acts of ethnic cleansing, in 2014 the power differential is such that only the Israelis can do it. Policy towards Jews in other Arab states is not relevant to this issue. The Cold War was not an ideological battle, it was a contest between the US (and its client states) and the USSR (and its client states) for global hegemony. Britain had a stake in the Cold War, but in 1948 it had a more direct stake in the viability of the shipping lanes it used to support its remaining empire. The tripartite alliance would have been successful in forcing the Egyptians to renege on nationalization had it not come under pressure from both the USA and USSR to withdraw. Afghanistan is not, nor has it ever been, a credible military threat. The NATO invasion of Afghanistan was a costly strategic mistake. A nation’s military capacity has, since the beginning of the industrial revolution, been predominately determined by its industrial capacity, its ability to build planes, tanks, guns, ammunition, etc. I said “there were no other figures at the time Sharon was prime minister and there are no others figures today”. Begin and Ben Gurion were not active in politics in the mid-aughts, and they are not active in politics now. I’m aware of what Sharon did in 1982 as defense minister–it is uninteresting to me because Sharon’s politics were more or less synonymous with the rest of Likud’s prior to his premiership, hence the reason he was forced to create Kadima. All of these facts are very straight, I assure you. “no other options”? Still ignoring the fact that Jordan is a Palestinian state, are we? The “no options” mantra is quite annoying, given that I’ve pointed out a few other options, and there are many more. Balance of power is different – yes, but disconnecting it from history is not helping in creating solutions, is it? The policy of Arab states towards their Jewish citizens was pure crime, and apology and compensations to them must be part of any “final peace deal”. “The tripartite alliance would have been…” – but it wasn’t, and that’s a fact. Egypt nationalized the canal, not “attempted to nationalize it”. Whether the nationalization would have been overturned, it was still nationalized. As to Afghanistan – it is not a country in the Western sense, so not “Afghanistan” was a threat, but the Afghan territory and the terrorists using it as their base. In case you’ve missed out – the Industrial Revolution is a bit old. These days, it has been surpassed and superceded by Cyber-Revolution, meaning a single geek behind a computer can do more damage than all tanks put together. Or a bunch of guys with box cutters. No, Afghanistan does not have the capacity to occupy the USA. But it has the capacity to considerably disrupt normal life there, the definition of terrorism. You said literally “no other figure in Israeli politics had or has the standing…” So why not accept you’re wrong here and that there were other figures who had the “standing” to evict Jews from their homes? Finally, you’ve managed to reduce a man’s decades of political career to his final couple of years. How would you feel, if people would refer to everything you’ve worked on for decades as “unremarkable”? The man was one of the founders of Likud, and was in politics for 40 years. It would be fair to say from the start it is uninteresting to you, instead of throwing away years of the man’s service of his country. The Jordan suggestion is only interesting if Israel is more likely to give Jordan territory that contains Israeli settlements than it is to turn that territory into an independent Palestinian state. I see no reason why that is more likely, especially given that the Palestinians desire independence, not annexation to Jordan. History is just that–history. It’s no longer reflective of the current strategic position. I only mentioned what happened in 1948 to illustrate what Israel was capable of doing when it was much weaker relative to Palestine and the surrounding Arab countries than it is today. Holding out for apologies is foolish when the continued existence of Israel as a Jewish state requires the two-state solution. I didn’t say the attempt wasn’t successful, did I? Word games aside, British imperial interests are the reason Britain did not turn against Egypt in 1948. The US, which had no direct stake in the Suez, had no clear reason to support the Arab states while it had several reasons to support Israel in 1948. Wouldn’t you agree? The terrorist organizations that inhabited and to some degree continue to inhabit Afghanistan and the surrounding countries were never a serious military threat to the United States. The terrorists do not possess biological or nuclear weapons, nor do they possess cyberwarfare resources. Military conflicts remain primarily a matter of conventional armies, navies, and airforces, resources that terrorist organizations severely lack. At their peak, the Taliban and Al Qaeda were no more powerful than the IRA, and their geographic distance from the United States makes it much more difficult for them to project what little power they possess. When interpreting an argument, you ought to give your interlocutor the benefit of the doubt–if I had claimed that Ariel Sharon was the only Israeli who ever existed with serious political clout, I would have been stark raving mad. It is much more reasonable to presume the interpretation which I went on to inform you I had intended–that there were no other leaders of Sharon’s clout willing to consider evacuation seriously at the time he was prime minister, and no new leaders have arisen since then to take his political place. You hit the nail on the head at the end–prior to his turnabout on settlement evacuation, Sharon was merely one of the founders of Likud, indistinguishable in political views from the other people of his generation and party. The decision to evacuate settlements, and the subsequent failure of Olmert and Netanyahu to follow that policy, will go down in history as the most significant credit to Sharon and the worst demerit for his successors.